Sunday, September 2, 8am-11am. This is the final chance to register for the race. There is no walkup registration at the race. The eleventh annual MainStreet Libertyville Twilight Shuffle 5K Run is an event for runners age 9 and older. 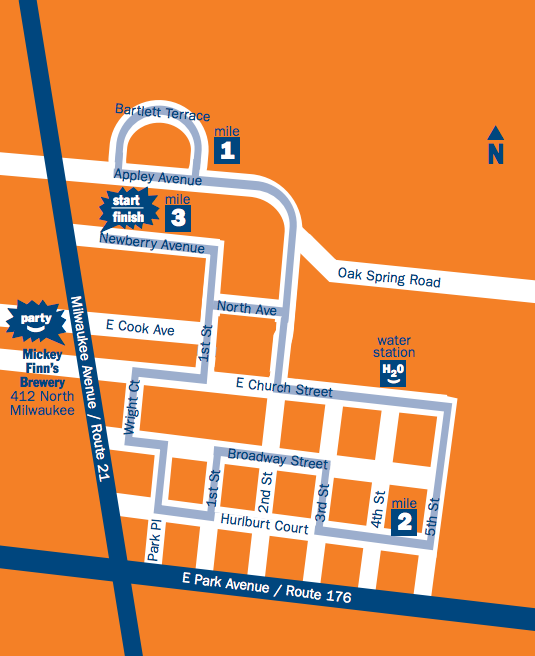 Enjoy a 3.12-mile run through one of the most scenic (yet hilly) neighborhoods in downtown Libertyville as hundreds of fans cheer you on. After finishing the course, all participants are invited to join their fellow racers for a fabulous post-race party (including light dinner and non-alcoholic drinks for all registered participants) at Mickey Finn's Brewery. The race will be professionally chip-timed. The first 800 registrants receive a goody bag and a Twilight Shuffle 5K technical fabric shirt. In addition to the men's size t-shirt (that runs large), this year we are offering a woman's v-neck version. The start/finish area is adjacent to the parking lots along the north side of Newberry Ave. just north of the Liberty Theater. The Sponsor Expo, which is held in these lots, opens to racers at 3:00pm on race day. Preregistered runners who have not picked up their packets ahead of time may do so from 3-4:50pm in this area. Restrooms, a first aid area, gear check, water stations, and sponsor booths will be located in this area. To make the course safer and more efficient, we will be lining up runners according to their pace time. Last chance to register is Sunday, September 2 at 11am. No registrations will be accepted or processed on race day. Please note, there are no refunds for this event.